WWKIPDAY is unique, in that it’s the largest knitter run event in the world. Each local event is put together by a volunteer or a group of volunteers. They each organize an event because they want to, not because they have to. They bring their own fresh ideas into planning where the event should be held, and what people would like to do. If it weren’t for these volunteer hosts, WWKiP Day would still just be an idea. So when you go to your local event, make sure you thank your host(s) and if you’re inclined, bring along some yummy treats to share. In the past some people have used this event as a means to show the general public that “not only grannies knit” and while that’s great and all, keep in mind that without those grannies’ we wouldn’t have the wealth of knitting knowledge that we do. 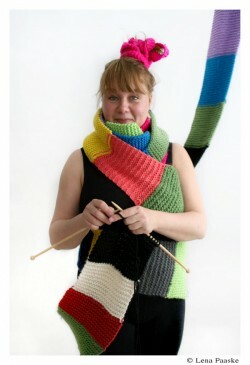 WWKIPDAY is really about showing the general public that knitting can be a community activity in a very distinct way. In some places there are many different knitting groups that never interact with each other, on WWKiP Day they come together in one place, making them hard to miss. In 2005, there were about 25 local events around the world. In 2006, there were about 70 local events, and in 2007, almost 200. In 2008, there were 800 events, and in 2009, 751 events. Over the years there have been local events in Australia, China, England, Finland, France, Ireland, Norway, South Africa, Sweden, United States and so many more countries. 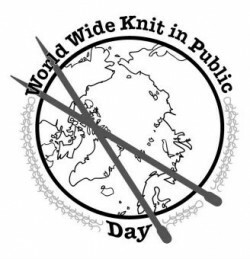 Until 2014 WWKIPDAY took place from the second Saturday to the third Sunday of June each year; making it a week long celebration of knitting and other fiber arts. Since 2015 we have celebrated it on ONE DAY. Help World Wide Knit in Public Day Keeps Happening! The community needs your support! The work involved in facilitating these events – especially from January when the registration opens…and the three months prior, where the interest peaks, is extensive. The scope of the work include updating and developing the website, writing newsletters, supporting the hosts by answering e-mails, producing the press material, press pictures, produce flyers, coordinating the interviews with the newspapers and magazines, handling the registrations of the events and then corresponding with all the many excited KIP’ers.